Media reports on new Apple iPhone 5 rumors have been running rampant. Here's where you can come to find out everything about the Apple iPhone. Whether fact or fiction we have you covered. What is really going to be interesting is to see how all these reports about the i Phone actually pan out. Now we know there are some rumors which appear to be just that... rumors. While we're also confident some of the rumors are indeed facts. This year is ripe for speculation due to a number of factors. First Steve Jobs has resigned his position as CEO of Apple Inc. Then we have to deal with the fact that the launch date has changed for the first time. All the fanboys know the i Phone typically launches in June, but this year is different. Everyone is expecting a Fall launch. Let's get things started and go over what we know about the Apple i Phone. Mark your calendars for Tuesday, Oct. 4. This is when Apple is going to make their announcement for the next generation of the Apple iPhone. But when can you actually purchase the iPhone 5? It will be a few weeks after the announcement is made. This should come as no shocker but it is expected that newly minted CEO Tim Cook will be making the announcement at the highly anticipated media event. Apple wants Mr. Cook to be the key presenter of the new device because it is going to set the tone for the rest of his time as leader of Cupertino. Besides the public knows very little about him and this will be their opportunity to get a idea of the man who has replaced Steve Jobs at the helm. Remember Apple is very leadership driven where consumers fall in love with the brand and the CEO. 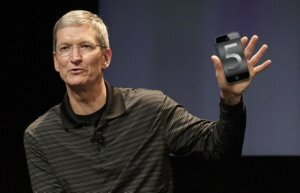 Tim Cook has all the pressure on him to perform and deliver quite the show for Apple's next generation iPhone 5. T-Mobile's Chief Marketing Officer Cole Brodman had a September 15 Town Hall with T-Mobile employees where he spilled the beans about the iPhone coming to TMo. Brodman states tha over the holidays they will be introducing two new smartphones. But here's the kicker, "We are not going to get the iPhone 5 this year," Brodman said. The devil certainly is in the details. Cole said not getting the iPhone 5 this year. What about next year? Does that mean TMo may get the iPhone 4/4S? These are the questions which must be answered. Stephane Richard who is the CEO of France Telecom may have just let the cat out the bag. While speaking to a small group of French reporters, Mr. Richard mentioned: "If we believe what we have been told, the iPhone 5 will be released on 15 October." Now let's remember that new iPhones do not always launch at the same time in all regions. Although the iPhone 4 launched in the U.S. and Eurpore at once. If you continue to follow the rumor mill and other speculation you can really begin to believe that the iPhone will be launching on either October 7th or October 15th. So a major retailer in Case-Mate for a brief minute had a landing page on their website that had accessory products designed for the as-yet to be revealed new iPhone 5. As you can tell speculation is running rampant about what the folks in Cupertino have planned for their legions of fanboys. We can learn some things about the new Apple iPhone 5 based on what was briefly posted online. The cases had the same rounded and tapered profiles as seen in other iPhone 5 cases along with the mute switch being found on the right side of the device instead of the left side. Right now the posting by Case-Mate does not verify if a new iPhone 5 is coming. You have to understand the cases have been rended based on a leaked design document used by Asian manufacturers. This document has not been verified as authentic due to a lack of supporting evidence for a new device. We're all in the dark for now! Ming-Chi Kuo an analyst who has sent a research note to MacRumors does not have any information that would suggest there is going to be an iPhone 5 released in mid-October. Instead, his sources point to the "N94" iPhone which in many circles is the code name for the iPhone 4S. From a supply chain perspective Apple Inc. plans to ship 30 million units through the end of the year. Additionally, there will be 5 million units of the existing iPhone 4 and iPhone 3GS models shipped to consumers. The supply chain speaks volumes about whether there is going to be a new Apple iPhone 5. But Mr. Kuo does not see anything which would indicate a new iPhone 5 is on the horizon. 512 MB of RAM: this is expected because the new iPhone will use the same A5 chip found in the iPad 2, which does offer 512 MB of RAM. Camera Module Height: equivalent to iPhone 4 and it should be noted that the camera thickness is the major limiting factor for the overall thickness of the iPhone. 3.5-inch display: same as the current iPhone 4, Kuo hasn't seen anything that would show otherwise. Glass Front and Back: will remain the same, although not 100% confident on this point. Here's the deal...the new Apple iPhone 5 is coming to Sprint. I'm pretty confident this is a fact and not a rumor. You have to recall that Verizon Wireless which operates on a CDMA framework has the phone so it only makes sense that Sprint which has the same platform would be getting the new iPhone too. 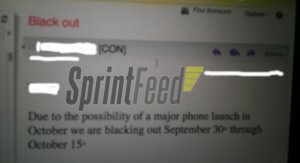 Before this memo was released I had the opportunity to venture to my local Sprint retail store and had the chance to chat up the manager there. I asked him, "So rumors have it that the iPhone is coming to Sprint. Is that correct?" He told me, "Yes, we're getting the iPhone but nothing official has been said/released yet." So I am confident in the reports that Sprint gets iPhone. Plus, the leaked memo also helps us pinpoint the release date too. Suppliers are the key to finding out what is going to take place with the new Apple iPhone. Right now there are two schools of thought: 1.) low end Apple phone 2.) high end Apple phone. It is pretty much apparent there will be a low end model iPhone that will be called the iPhone 4S and the high end model will be called the iPhone 5. Take a look at new iPhone leaks to see what's in the pipeline. I'm thinking Apple is keen on going after more market share so the best way to do this is going to be with the iPhone 4S. But to keep the prestige of the Apple brand there will be a new Apple iPhone 5 with more features and obviously a higher price point to retain exclusivity. of comments have already been left on our site. Have your say about what you just read! Leave me a comment in the box below.